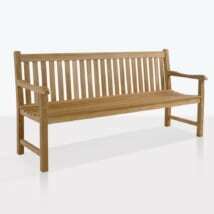 Dashing and timeless, with an ergonomic design; the Wave Teak Outdoor Bench (2 Seat) is among our most popular styles. 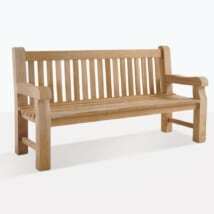 Let comfort engulf you as you breathe in the tranquility of your outdoor space in this simply divine bench! The Wave Range of seating sports hardy, solid framework, with slats running vertically down the back and seat of each piece curved in such a way that not only offers ease and comfort to whoever sets in it, but looks so attractive and pleasing to the eye! 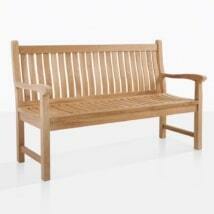 As well as this gorgeous 2 Seater, we have a larger 2.5 and a 3 Seater Bench to accommodate most spaces! The Wave Teak Outdoor Bench (2 Seat) is made out of A-Grade Teak; long lasting and durable, you will be proud to call this your own! We are thrilled to offer such an extensive range of A-Grade Teak at Teak Warehouse because we know, and have proven time and time again that it is the best wood for outdoor use, as well as indoor. It is beautiful, easy to clean and it is durable. We use wood cut after the tectona grandis (teak tree) ages 40 plus years in order for there to be a surplus of rubber and oil generated by the tree. This provides our furniture with the strength it needs to withstand changing elements and last a long amount of time outdoors! As well as precious A-Grade Teak, we have a terrific amount of products that are marine grade and ideal for making your outdoors into a tremendous living area you will spend all of your time in. Choose from #316 Stainless Steel, Aluminium, many styles of All Weather Wicker, Reclaimed Teak, Resin and Raw Concrete in items such as sun loungers, deep seating, dining sets, relaxing chairs, accessories and planters! We have it all. The Wave Benches sold so well at Teak Warehouse, we decided to make a dining Arm and Side Chair to compliment and fill out the range. Use the lovely, lofty Arm Chair as a mini club chair, alongside your Wave Teak Outdoor Bench (2 Seat) or Loveseat! This is the perfect set for those who have limited space, but want a seating area they can host people in, ensuring comfort and style! 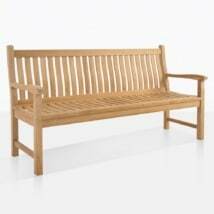 The Wave Teak Outdoor Bench (2 Seat) is a wonderful piece of furniture to have on your patio or porch, giving space to relax and take in your your surroundings. Place an Accent Table to one side and enjoy putting your feet up with a book and a nice hot cup of coffee! 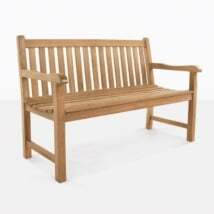 We love the Wave Teak Outdoor Bench (2 Seat) in the garden! Purchase two of them to face each other and place cushy throw pillows in your favorite Sunbrella® color on them and you’ve got a charming, classic alternative to deep seating. 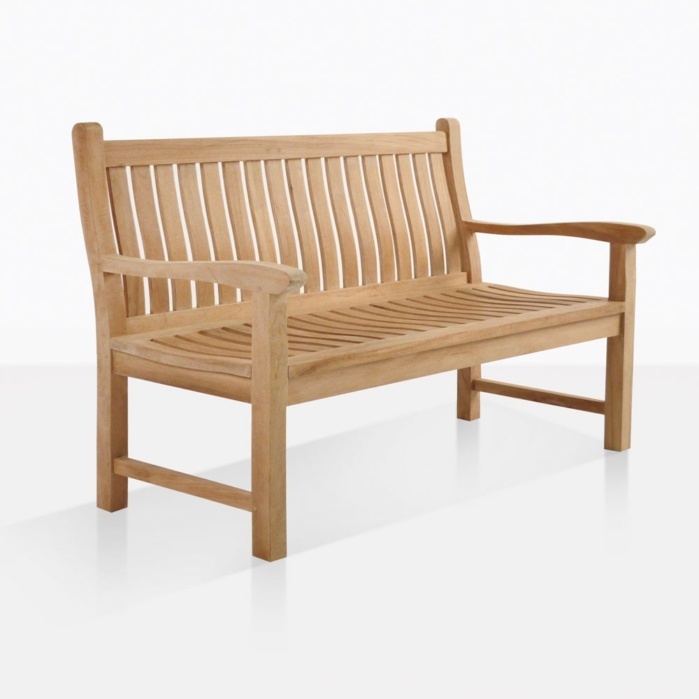 Timeless and ergonomic, this Wave Teak Outdoor Bench (2 Seat) is among our most popular styles. Let comfort engulf you as you breathe in the tranquility of your outdoor space.